Ireland’s ‘buildings record’ says it has to make its six staff temporarily redundant. 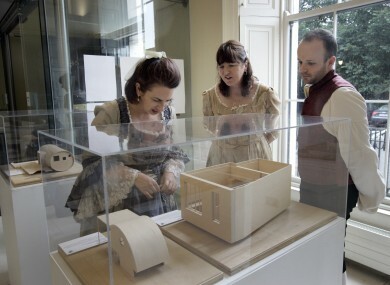 Exploring an exhibition on the ground floor of the Irish Architectural Archive on Merrion Square, which has to temporarily close in a cost-cutting measure. THE CHAIRMAN OF the Irish Architectural Archive has confirmed that the archive will be closing up for July and August because of cutbacks and an overall deficit. The Archive released a statement yesterday saying that the move will see all staff being made “temporarily redundant”. The organisation, which describes itself as Ireland’s buildings record, was founded in 1976 and preserves blueprints, drawings and records relating to architecture for the whole island of Ireland. It holds over 2.5 million drawings and documents, half a million photographs and a reference library of 30,000 items. It is a limited company with charitable status. In its statement, the Archive says that it was closing in an attempt to avoid insolvency. The cost-cutting measure is hoped to help reverse the deficit it is facing – in 2012, it ended with a €30,000 deficit. Now it is facing into ending 2013 with a €100,000 deficit. The closure over the late summer will mean that the public will have no access to the records held by the Archive. During this time, says Michael Webb, Chairman of the Archive, efforts will be put into further fundraising – nearly 80 individuals and companies have pledged or paid €44,000 since February of this year. This money has meant that the closure is limited, for now, to two months. The Archive had warned of this eventuality last month when administrator Colum O’Riordan revealed to TheJournal.ie that it had even asked Nama for assistance. “The board deeply regrets the inconvenience this closure will cause, and the impact on its staff,” said the statement. The full closure will run from 5pm, 28 June to 2 September (the office reopens – the reading room and gallery will reopen on the following day). Talks are continuing with Jimmy Deenihan, Minister for Arts, Heritage and the Gaeltacht, and his department, says the Archive. Email “Cutbacks force Architectural Archive to close for summer”. Feedback on “Cutbacks force Architectural Archive to close for summer”.